Are you a family member of someone who has experienced mental health concerns, a mental health professional, or do you, yourself, have lived experience as a service user? Are you interested in hearing real perspectives on people’s experiences with the mental health system? Despite shifts towards inclusiveness and partnership in mental health services development, meaningful open communication between professionals, service users, and families within the mental health system remains a challenge. This Mental Health Trialogue (MHT) is a monthly forum that brings together personal perspectives from providers, peers/survivors, family members and other interested parties to discuss issues and experiences with the mental health system. The goal of the forum is to foster rich discussion and to change the perception that only those who work in the field of mental health are the experts in mental health. This month's Trialogue will focus on forgiveness. A message from Angel Serrano, Peer Worker, who will be opening this MHT: "To forgive or not to forgive: That is the question? Is it necessary to always forgive to have and to enjoy spiritual, physical, emotional, social and mental good health or is it sometimes okay and even necessary not to forgive in order to heal and to have mental good health? For those who believe that forgiveness is absolutely essential for their holistic healing and health as I do - then the questions are - What does it mean to forgive? How do I sincerely forgive from the heart? Is Forgiveness a process? Is genuine forgiveness possible? What are the benefits to forgiving? Is it necessary to forget the wrongdoing, abuse and trauma in order to truly forgive and heal? In my journey of positive transformation, forgiveness and forgiving was and is absolutely essential for my healing and mental health. Come and hear and and partake of (if you choose to) in an insightful and lively Trialogue group discussion from different beliefs and perspectives on this vitally important 12 Trialogue theme on - "Forgiveness & Mental Health. Hopefully we'll see you there! Trialogue meetings are open to current or former mental health service users, families and friends, professional mental health workers, prescribers, as well as all community members with an interest in mental health. All are encouraged to attend! 1-2 organizers from the Institute for the Development of Human Arts will open the forum by explaining the purpose of MHT, then initiate a discussion about that month’s theme. We will then open the conversation to all in attendance to share their responses if desired and foster community. Snacks and refreshments will be provided. This Mental Health Trialogue (MHT) is a monthly forum that brings together personal perspectives from providers, peers/survivors, family members and other interested parties to discuss issues and experiences with the mental health system. The goal of the forum is to foster rich discussion and to change the perception that only those who work in the field of mental health are the experts in mental health. This month's Trialogue will focus on spirituality. This Mental Health Trialogue (MHT) is a monthly forum that brings together personal perspectives from providers, peers/survivors, family members and other interested parties to discuss issues and experiences with the mental health system. The goal of the forum is to foster rich discussion and to change the perception that only those who work in the field of mental health are the experts in mental health. This month's Trialogue will focus on person-centered practice. This Mental Health Trialogue (MHT) is a monthly forum that brings together personal perspectives from providers, peers/survivors, family members and other interested parties to discuss issues and experiences with the mental health system. The goal of the forum is to foster rich discussion and to change the perception that only those who work in the field of mental health are the experts in mental health. This month's Trialogue will focus on the power of language. Language is powerful. It can make us or break us. We have to be careful and wise in the use of language in and outside of the mental health system, as language matters and can have positive powerful effects on wellness, and negatively powerful as well. We must first do no harm in word (language), and in deed and practice. This Mental Health Trialogue (MHT) is a monthly forum that brings together personal perspectives from providers, peers/survivors, family members and other interested parties to discuss issues and experiences with the mental health system. The goal of the forum is to foster rich discussion and to change the perception that only those who work in the field of mental health are the experts in mental health. This month's Trialogue will focus on vulnerability in unjust systems. This Mental Health Trialogue (MHT) is a monthly forum that brings together personal perspectives from providers, peers/survivors, family members and other interested parties to discuss issues and experiences with psychotropic medication, among other subjects. The goal of the forum is to foster rich discussion and to change the perception that only those who work in the field of mental health are the experts in mental health. This month's Trialogue will focus on self love and self care. A message from one of our facilitators: Hello, my name is Angel Serrano and I work as a Peer Counselor for many years now and I am also an active member and participant of IDHA. I am so looking forward to opening the Trialogue discussion on the awesome theme that was chosen by the group for an interactive group discussion on "Self-love & Self-care" because this really hits home with me and was and still is an ongoing very important part of my life's journey, calling and purpose, which is essentially to truly love and care for myself. I will begin by sharing my understanding of a balanced Self-love and Holistic Self-care and all this entails for me and what I believe the difference is between having a healthy balanced Self-love and narcissism and then I will briefly share my journey from Self-hate and self-loathing and self-destructive behavior to Self-love and my healthy wellness practices of Self-care. Then the floor will be open for questions, comments and people's personal beliefs about and practices of "Self-love and Self-care" and how this impacts their lives, relationships, Jobs and their love and care for others. I wholeheartedly believe that this Trialogue discussion of "Self-love & Self-care" is a vitally important and much needed theme discussion that all can in some way identity with. I am looking forward to sharing my heart and also hearing and learning from the minds and hearts of others who will be at this Trialogue. This Mental Health Trialogue (MHT) is a monthly forum that brings together personal perspectives from providers, peers/survivors, family members and other interested parties to discuss issues and experiences with psychotropic medication, among other subjects. The goal of the forum is to foster rich discussion and to change the perception that only those who work in the field of mental health are the experts in mental health. This month's Trialogue will focus on knowing your purpose and calling in life. A message from one of our facilitators: "Hello My name is Angel Serrano and I am an active participant and member of IDHA and a Peer Worker on an ACT Team for 13 and a half years now and with the assistance of Jessie Roth I will be facilitating a Trialogue and group discussion on: "Knowing Your Purpose and Calling in Life." No matter what our specific individual calling and purpose is in life- I believe that everyday is filled with purpose and opportunities for positive change within and outside of the mental health system and that we are all here "First, To Do No Harm. "- I believe that "Our prime purpose in this life is to be good to ourselves and to be good to and. help others. And if we can't help them at least let us not hurt them." "We are all here to heal, not to harm. We are here to love, not to hate. We are here to create, not destroy." "It is love alone that leads to right action. What brings order in the world is to love and let love do what it will." Knowing our individual calling and purpose and how it specifically fits into what we do in or outside of the field of mental health or "Both" will make for a very needed and interesting Trialogue group discussion. Hope to see you at our next Trialogue to discuss this very important theme, to learn from each other and to draw light from each other. Onward & Upward!" 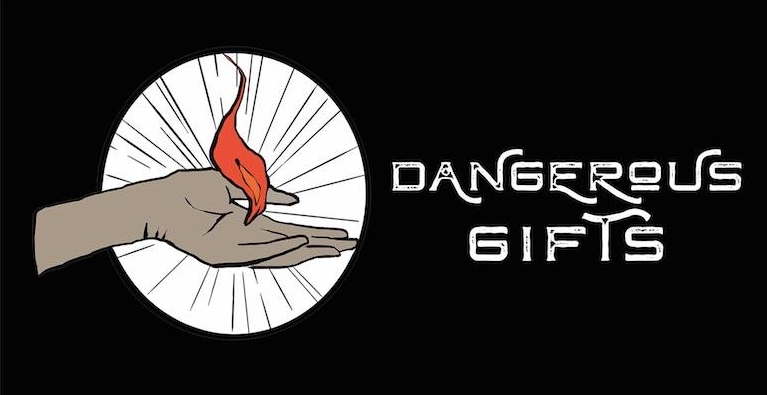 A Celebration of Dangerous Gifts! So many of the things labeled “mental disorders” have lessons to teach and power to give if we learn how to harness them. We have found this much easier to do in community. and the opportunity to meet up with friends and strangers to talk about the transformation of the mental health system! In this 2 hour workshop, we will gather to explore what healing from trauma looks like and how we cultivate personal and community resilience. Using a combination of experiential exercises and group discussion, we will examine what it means to return home to our bodies, create safety and connection, and learn embodied techniques to respond to triggers and create more choice in our lives. We will look at trauma from a somatic and social-justice informed lens, understanding our survival responses as adaptive and smart, not problematic and broken. We will skill-share about available resources and share our collective wisdom. Participants will leave with a sense of possible paths forward and new connections with folks in their community. This workshop will be facilitated by Jacks McNamara, a healer, teacher, artist, and writer based in Santa Fe, New Mexico. Jacks offers somatic coaching, intuitive counseling, and wellness mentoring to clients locally and across the world via Skype. Jacks completed 3 years of somatic coaching training with Staci Haines and Generative Somatics, and has been peer counseling, facilitating support groups, teaching art and writing classes, and leading workshops around mental health, trauma, leadership, and resilience since 2004. 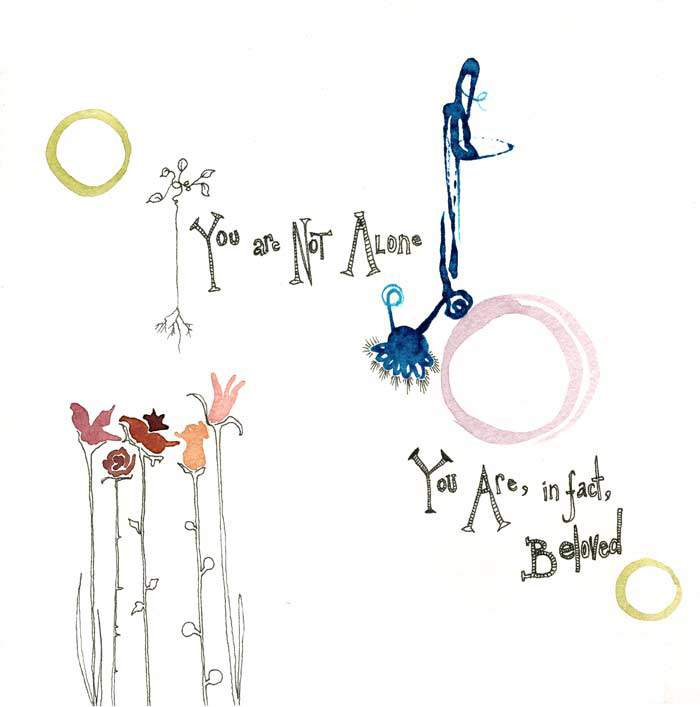 In 2002 they co-founded The Icarus Project, an international support network and participatory adventure in mutual aid and radical mental health. Jacks is the author of Inbetweenland, a collection of poetry, co-author of Navigating the Space Between Brilliance and Madness, and their life and work is the subject of the poetic documentary Crooked Beauty. Jacks loves to help all kinds of amazing people heal from trauma and transform their lives. This Mental Health Trialogue (MHT) is the first of a monthly forum that brings together personal perspectives from providers, peers/survivors, family members and other interested parties to discuss issues and experiences with psychotropic medication, among other subjects. The goal of the forum is to foster rich discussion and to change the perception that only those who work in the field of mental health are the experts in mental health. MHT provides a supportive, non-judgemental space to share unique stories, find solidarity and discover new complementary perspectives that offer clarity, insight, and supportive community. PLEASE NOTE: MHT is not a support group, a source of medical/psychiatric advice, or a therapy session. -Had a profound spiritual experience? -Experienced extreme, altered, or transcendent states of consciousness? -Found deep meaning in disruptive, turbulent, or traumatic times? -Experienced moments of deep bliss or connectedness? -Found any of these experiences too difficult to speak out loud or share with others? Spiritual emergence is a natural part of human development that can offer us glimpses of peak states and help us evolve toward our highest potentials. Whether the experiences are sought out or spontaneous, both the fleeting moments of bliss as well as the disruptive states can challenge everything about one’s former ways of being in the world. Because these transcendent states are in service of our growth, it is important for us to develop a cultural framework to share them so that we can support each other in achieving healthy integration. Join us for a community dialogue hosted by Katrina Michelle, PhD, LCSW, a holistic psychotherapist and spiritual seeker. This group nurtures a safe space to share our spiritual experiences, resistances, and desires for transcendence. Spiritual seekers and experiencers alike can share and gain practical information to support healthy integration and positive transformation. Doors will close at 7:15 so please arrive on time! In this jam we will warm up our bodies and voices, use our voices in song and use our bodies to move and dance freely, and capture our inner experience with poetry, drawing, and coloring. Our process is unique in centering mutuality, peer support and skill sharing from an eye to eye perspective. 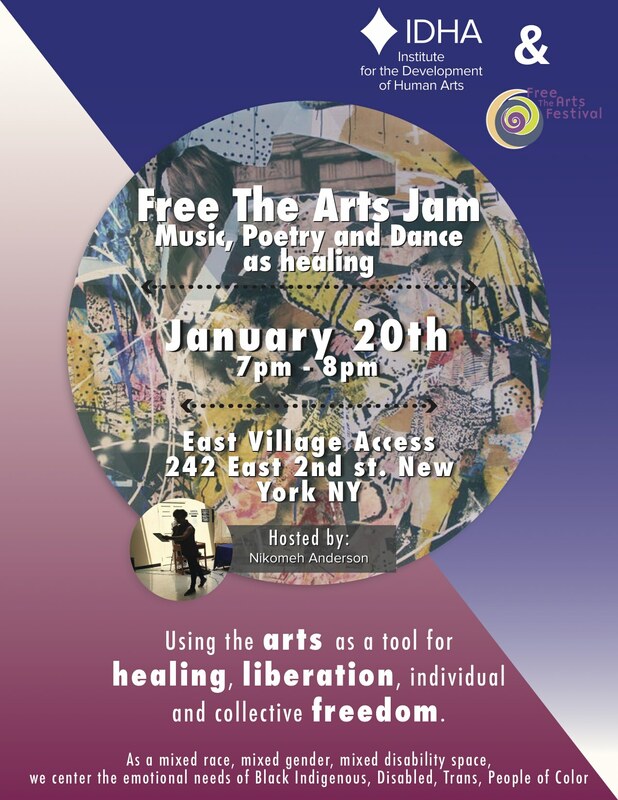 We use arts as a tool for healing, liberation, individual and collective freedom. Any documentation is towards recording and building a process of Creating The People’s DSM (Different States of Mind-Matter), a community based project to make a creative alternative to the oppressive Diagnostic Statistical Manual of Mental Disorders that imprisons, erases and gives stigma to Neurodivergent, especially Black, Indigenous, Queer, Trans People of Color with trauma and lived experiences of mental health; the goal of the project is to create new language, ideology, and practices around inner experience, internalized oppression, mental and whole soul health. As a mixed race, mixed gender, mixed disability space, we center the emotional needs of Black Indigenous, Disabled, Trans, People of Color by encouraging any intersection of white, cisgender, and male people to listen more, speak less, and hold space for silence and others’ processing styles. We will also ask everyone for any accessibility needs, as well as for People of Color to voice any emotional accessibility needs / any needs as a person of color in the space. Hosted by: Nikomeh Anderson - A Black and Mixed Race, Trans and Gender Expansive, Neurodivergent, Trauma Survivor, Creative Producer and Collaborator with Free The Arts Festival, Multidisciplinary Theatre Maker, Advocate, Educator, Facilitator, and Cultural Activist who draws the connection to the greater societal picture. Click to download our event flier! What does it mean to be mentally “different” in a culture dominated by reason? How can we pursue other dimensions of our humanity that are often less valued in our time? How do we acknowledge and value our own sensitivity and yearning for ways of being that expand beyond the range of rationality? There are many thinkers, artists, and leaders we can look to for suggestions. Take for instance, Vincent van Gogh, a critical and visionary artist who placed a greater value on spirituality and justice than many of his contemporaries. The courage of his work shows us that it is possible to step outside the norm, to value alternate ways of thinking, and to connect with each other in our desire to express ourselves through the arts and spirituality. We can draw inspiration, solace, and wisdom from engaging with courageous works of art and spirituality such as Van Gogh’s and by joining together with others who consider creativity and spirituality important parts of their life, their story, and their healing . 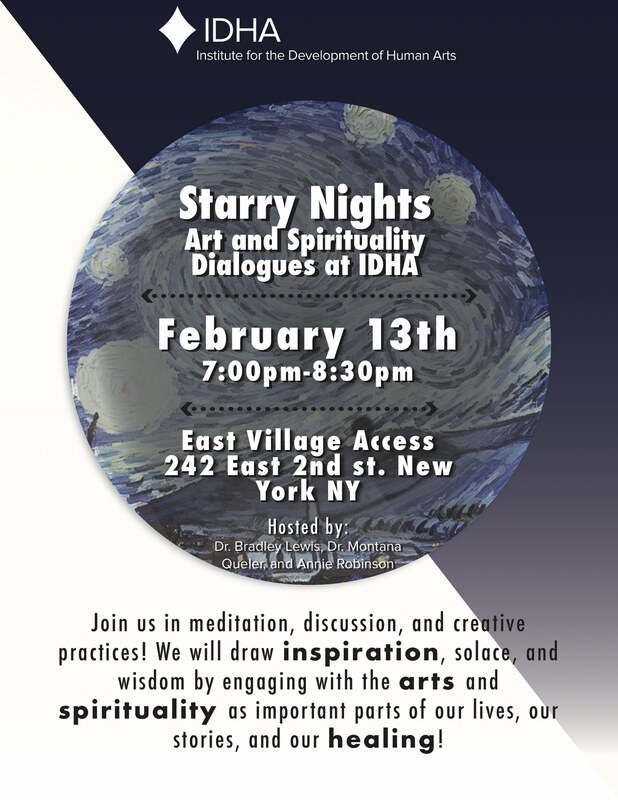 In this workshop, we begin with a short (10 min) guided meditation exercise, followed by a group discussion of a work of spiritual art (such as van Gogh’s painting “Starry Night” or a Mary Oliver poem). Then we engage in a personal creative exercise that furthers our understanding of the work. We will leave connected to a deeper meaning for ourselves and our communities. Dr. Bradley Lewis - psychiatrist, therapist, and humanities professor. He is devoted to enriching clinical practice and everyday life through integration with the arts, humanities, and cultural/religious study. Dr. Montana Queler - psychologist and licensed mental health counselor. Her approach to therapy honors suffering and difference. Annie Robinson - Annie Robinson - wellness program facilitator at NYU School of Medicine, narrative medicine instructor, certified wellness coach, and doula. She is dedicated to guiding people in explorations of their innate capacity to heal, awaken, and flourish. Whether you're enrolled in classes or not, you're invited! Come hang out with some of the organizers and faculty of IDHA, see our classroom space, and become part of our community as we head straight into one of our first big initiatives: "Re-Thinking Crisis"! We will have snacks, entertainment, and great discussions! Hey friends and comrades - come bask with us in the glory of August in NYC! The faculty and organizers at IDHA decided it's a great time to have a potluck and networking hangout before we embark on our series of classes in the fall. ☀️ Did you come to our launch event back in June and have a good time? ☀️ Are you interested in building supportive community in NYC around issues of mental health and social justice? ☀️ Come eat some food and hang in the park with us! Issa Ibrahim - "Confessions of a Zombie Savant"- music and conversation with Geo Geller.